Extreme weather events, such as hurricanes, can prove detrimental to flue-cured tobacco yield and quality. Specific to hurricanes, both wind and water are the two primary elements of concern. Water is a concern due to flooding and/or saturated soil conditions that greatly reduce oxygen in the rooting zone of the plant. The reduction or absence of oxygen produces wilting symptoms in the leaves making them more susceptible to sunscald if temperatures become excessive in the days following a storm. While standing water is of great concern, it is wind that may result in greater damage to plants. The issue associated with wind is twofold. The primary issue is leaf drop, which causes the physical removal of a leaf or leaves from the stalk. The secondary issue associated with wind is bruising, which results from cell destruction thus causing water and chlorophyll to leak from within the plant cell. This bruising effect will ultimately cause the leaf to turn brown or black in color and typically results in very poor cured leaf quality, even when harvested immediately following severe weather. In addition, bruising is commonly associated with a curing condition referred to as barn rot, which also results in very poor leaf quality, value, and demand. If bruising is not a considerable factor, wind may also increase the rate at which a leaf ripens (or senesces) due to the natural presence of the plant growth regulator known as ethylene. In general, the most pronounced effects of ethylene are the senescence and ripening of leaves and fruit (Taylor et al., 2012). With the remnants of Hurricane Florence having finally exited North Carolina, tobacco producers must now consider the lasting effects to leaf that presently remains on the stalk and is largely absent of visual injury. As was previously noted, leaf that exhibits immediate bruising, discoloration, or physical damage following a storm event will more than likely result in poor quality once cured. The following applies to commercial producers largely outside of the regions most affected by Hurricane Florence. While data are not readily available that demonstrate the effects of extreme weather events, we do have information from a holding ability study conducted at the Border Belt Tobacco Research Station (near Whiteville, N.C. in Columbus County) in 2011. This data set may prove useful because plots were exposed to Hurricane Irene for a brief period of time (August 26 and 27, 2011). Below are observations from that specific study. Readers should note that results represent the upper-stalk positions only (leaf and tip) and do not include the lug and cutter groups. In addition, it should be noted that rainfall and wind estimates provided from 2011 are much less than those from 2018. Cured leaf measurements (yield, quality, price, and value) were greatest when tobacco was harvested two days after Hurricane Irene (Table 1). Wind and rain were not major environmental factors that were generally associated with Irene in the Border Belt region of North Carolina (Table 2); therefore, leaf bruising and standing water were not contributing factors within this harvest interval. Following the first harvest timing, remaining plots were subsequently harvested every 10 days, which is the approximate amount of time required to complete a curing cycle (fill, cure, bring into order, and empty). In the second harvest interval (12 days after Irene), cured leaf yield began to decline though not as rapid as the 22 and 32-day harvest intervals (Table 1). However, cured leaf quality, price, and value were significantly reduced relative to the 2-day harvest timing (Table 1). The reductions in quality and economic measurements are largely due to significant reductions in cured leaf quality that resulted from wind damage, which hastens the natural ripening process, as previously referenced. Cured leaf measurements continued to decline as harvest was delayed by 22 days and were lowest in the 32-day interval (Table 1). Table 1. Upper-stalk position yield, quality, price, and value as influenced by harvest delay following Hurricane Irene in 2011a,b. a Treatment means followed by the same letter within the same column are not significantly different at the α=0.05 level. b Results are pooled across the varieties PVH 2110, NC 196, GL 395, K 326, GF 318, CC 65, NC 299, NC 297, PVH 1452, and CC 35. In addition to the numeric values presented in Table 1, cured leaf color is provides a complimentary estimate of leaf quality. 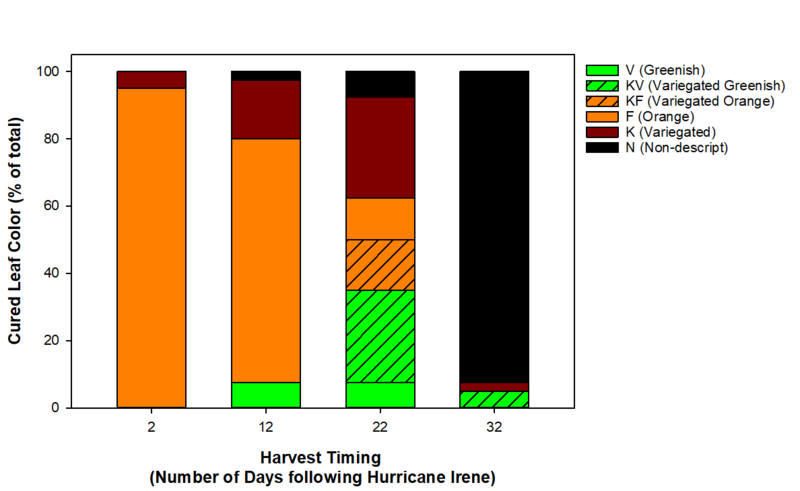 Overwhelmingly, leaf color was dominated by ripe to over-ripe grades of tobacco (F and K color descriptions) when harvest occurred two days after Hurricane Irene (Figure 1). When harvest occurred 12 days following Irene, Greenish (V) and Non-descript (N) grades account for 10% of the grade distribution, thus lowering both quality and price (Figure 1, Table 1). Further delay of harvest to 22 days after the storm system cleared increased N grades to 7.5% of the total and variegated, under-ripe grades (KV and KF) to 42.5% (Figure 1). In addition, F and K grades were reduced to 42.5%, which is a decline of 47.5 and 57.5% relative to the two previous harvest intervals. In the final harvest interval, N grades accounted for 92.5% of all grades received, with KV and K grades accounting for 5 and 2.5%, respectively. Ultimately, as harvest was delayed leaf deterioration and respiratory losses became more pronounced, with a large portion of leaves expiring prior to harvest. Figure 1. Figure 1. Upper-stalk cured leaf color as influenced by harvest delay following Hurricane Irene in 2011. Data are pooled across 10 varieties and reflect test averages of USDA color standards. Figure 2. Leaf response to Hurricane Florence over a three day period – a.) Saturday (Sept. 15) and b.) Tuesday (Sept. 18). Photo courtesy of Norman Harrell – N.C. Cooperative Extension of Wilson County Service. Collectively, these results indicate that tobacco should be harvested as soon as possible following a storm of this nature, particularly in the latter portion of the growing season when tobacco is more likely to be mature and ripe. This also means that growers likely have a window of time that is less than 10 days in length before deterioration becomes too great and leaf quality is negatively impacted. This is important to note because weather data recorded from Hurricane Irene indicates that 2.01 inches of rainfall was received and that average winds were generally less than 13 miles per hour (Table 2). It is extremely plausible that as rainfall totals and wind speeds increase, leaf holding ability will be reduced to a number of days less than those presented in the current data set (Figure 2). Hurricane Florence was both stronger and longer in duration in many places of the state when compared to Irene. This point is further documented at the Border Belt Research Station in Table 2. Producers are strongly encouraged to consider harvest initiation on a field-by-field basis and to consult with local N.C. Cooperative Extension Agents when needed. Table 2. Daily total rainfall, average wind speed, and maximum wind gust estimates collected during Hurricanes Irene (2011) and Florence (2018) at the Border Belt Tobacco Research Station near Whiteville, North Carolinaa. a Data provided by the North Carolina Climate Office – Climate Retrieval Observations Network of the Southeast Database. b Data not available at the time of information release. Taylor GT, Fisher LR, Smith WD, Edmisten KL, Wells R, Jordan DL, Blankenship SM. 2011. The effects of 1-methylcyclopropene on ripening delay and holding ability in flue-cured tobacco. Tobacco Science 48:15-19.